Take Exit 6. Turn right. Follow KY Highway 100 to US 31-W. Turn right. Go to third traffic light. Turn right. Go two blocks, Simpson County Detention Center will be on the left just before the railroad track. Take Exit 2. Turn left. Follow US 31-W to the sixth traffic light. Turn right. Go two blocks, Simpson County Detention Center will be on the left just before the railroad track. Follow Highway 100 to 31-W. Turn right. Go to third traffic light. Turn right. Go two blocks, Simpson County Detention Center will be on the left just before the railroad track. Follow KY Highway 100 to US 31-W. Turn left. Go to next traffic light. Turn right. 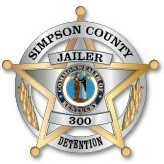 Go two blocks, Simpson County Detention Center will be on the left just before the railroad track.